Every year approximately 50 lakhs students graduate in India and hardly 10 percent of them are absorbed in private sector jobs. Further, the job scenario in the private sector is deteriorating with each passing day. This has resulted in increase in number of aspirants applying for government jobs every year. Although, the number of vacancies might fluctuate over the years, but aspirants will keep on increasing as there is lack of employment opportunities in private sector. With more than 2 crore aspirants/test takers every year, there is a huge scope to create a big brand which can have huge impact. To grab and exploit this big opportunity, Anil Nagar founded Career Power to provide quality education and coaching to thousands of students. Career Power focuses on government jobs and primarily caters to two main exams, Bank and SSC. Currently, they provide both offline (classroom based) and online courses. Company has more has 70 classroom training centres spread across all major cities in India. Entrepreneur India interacted with Nagar to get the better understanding of edutech space. How did Entrepreneurial bug bit you? After I completed my graduation from IIT BHU, I always wanted to do something of my own. I always used to feel that I am immensely talented and I am born to do something big. I tried to start two ventures but could not start them due to lack of funds. Then again in 2009, I started one venture in education space, but failed miserably. In April 2010, Career Power happened and this was when I had finally found a segment which was really big and at that time there was no big brand. There are many other sectors which are on hype as compared to education. So, what was the reason behind choosing education as a sector to enter in the market as an entrepreneur? Education as a sector was always close to me and this is the sector which I understood quite well. Being brought up in a village, I had to struggle to get good education and good training for my IIT exam. I think the biggest pleasure in education is that you are a part of the success story of students; multiplied by number of students you mentor/guide. It is noble profession and the kind of respect you get thereupon, cannot be expected in any other profession. In terms of business opportunity, this was totally untapped and unexplored sector - test prep for government jobs (Banking, SSC). With more than 10 million aspirants, it came out as the best opportunity one can ask for. What challenges did you faced in terms of taking your product to the market? And how did you overcome them? Well, initially we started the company with classroom based coaching centre and we opened our first branch in Delhi. It was a traditional product, so, it is easy to take it to our audience. We were extremely focused on our quality since beginning and our students gave phenomenal results in various government jobs. Out of 32 people in the first batch, 26 students were selected in various jobs. This set the ball rolling for us. The real challenge came in when we started expanding. Funding was a big issue. Till date, we do not have any external funding or loan on our company. Because of lack of funding, our initial growth was slow, but again that came as a boon for us. It helped us in getting better control of the growth and taught us tough lessons, with respect to utilization of each earned rupee. What make Career Power unique from others dealing in the same sector? At Career Power, our USP is our strong presence in online and offline mode (classroom based). Our online communities - bankersadda.com and sscadda.com attracted more than 20 million users in last one year, while we have more than 70 physical branches across India. Both, online and offline work as a complementary modes to each other - online helps in promoting offline and offline promotes online. Beside this, our professional management, work culture and clear focus on student success differentiating us from others. Specially, in our segment (government job test prep), we are the only company which is run professionally and follow a philosophy of ‘Happy Teachers, Successful Students’. Highlight your business and revenue model. Career Power offers (paid) classroom training programs to students. Classroom programs are available for written test as well interview stages of selection process. 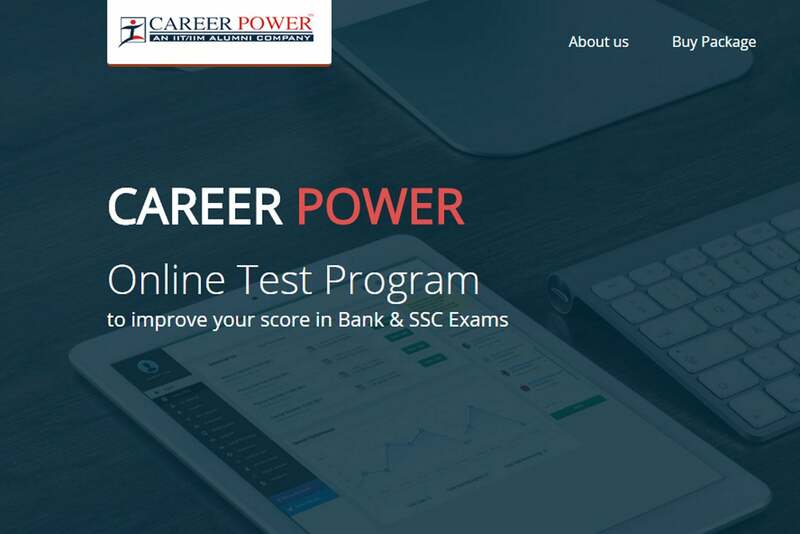 Also, Career Power sells online educational products (currently online test series) through its online platforms - bankersadda.com and sscadda.com. We have 70 branches across all major cities in India and within this FY, we want to increase the count to 100. Last year, more than 5000 students were selected in various banking and SSC jobs from our classroom programs. This year how many students you have trained through your platform? This year we will be training approx 110,000 students - 50,000 in our classroom programs and more than 60,000 through our online programs. Currently, there are more than 700 people working under brand Career Power, out of which, more than 300 are teachers. Currently, where is your presence? Currently, we have 70 branches across major cities including Delhi, Lucknow, Kanpur, Patna, Ranchi, Kolkata, Bhopal, Ahmedabad, Hyderabad etc. We are planning to increase our focus on Southern India and Western India and open 30 more branches within this financial year including - Bangalore, Chennai, Pune, Mumbai, Nagpur, Truchi, Vizag etc. 2. Adding more products in our offerings like - CTET, Railways, NDA, CDS etc. All these products come under the category of government jobs. We want to be one stop place for all government jobs in India. 3. Increase our product portfolio in online segment. Currently, we are offering test series for bank exams, but soon we will be offering videos, live classes, online doubt clearing, online interactive books etc. through web and mobile app.